At room temperature, it is a white powder, odorless, tasteless. It has a strong ability of water absorption. It is highly soluble in water to become a solution with high viscosity. It become unstable upon higher temperatures or acidic condition, primarily being deacetylated or being degraded into monosaccharide or smaller molecular-weight polysaccharide. It is not soluble in organic solvent like ethanol, acetone and ether. Its salt is quite stable to heat without being destroyed when heated to 80 °C. 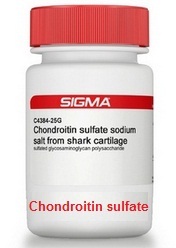 Chondroitin sulfate is a mixture of acid mucopolysaccharides extracted from the cartilage of pigs, cattle, chicken, and shark cartilage. According to their differences in chemical composition and structure, it is divided into A, B, C, D, E, F, H, etc. It mainly contains mucopolysaccharides such as chondroitin sulfate A and chondroitin sulfate C. Both chondroitin sulfate A and C contain D-glucuronic acid and 2-hydroperoxy group-deoxy-D-galactose, and contain equal amounts of acetyl and sulfuric acid residue. The only difference between them is the different position of sulfuric acid ester on the hexosamine residues. Chondroitin sulfate A can enhance the activity of lipase, causing the decomposition of triglyceride in chylomicron so that the blood will become clean due to the decrease of chylomicrons. It has anticoagulant and antithrombotic effect, and thus is clinically used for the treatment of coronary artery disease, elevated blood lipids and cholesterol, angina, neuralgia, myocardial ischemia and myocardial infarction embolism. It can also be used for prevention and treatment of hearing disorders and migraine caused by streptomycin, neuropathic pain, elderly pain of shoulder, backache, arthritis and hepatitis and skin cosmetics. It is reported that chondroitin sulfate can also be effective on improving and repairing of articular cartilage, synovium, keep the lubrication between the joints cartilages and making it elastic, alleviating joint pain and inflammation. Moreover, it also has special efficacy on symptoms located in tendons, ligaments, and diaphragm. Chondroitin sulfate is also an important component of eye tissue. It can boost the water metabolism in corneal, improve the microcirculation, protect the cornea and promote the repair function of corneal tissue. It can also form a protective form in the corneal surface to prevent water evaporation which can effectively relieve visual fatigue and symptoms of dry eye; In additions to its anti-bacterial and anti-inflammatory effect, taurine can also participates in a lot of physiological activities in eye tissue and promote metabolism, alleviate visual fatigue. 1. Chondroitin sulfate is mucopolysaccharides-class substance extracted from animal cartilage. It has an important role in prevention and treatment of cardiovascular disease, joint disease, and currently is an important biochemical product on the market. 2. As a health food or drugs, chondroitin sulfate has been long used to prevention and treatment of coronary heart disease, angina, myocardial infarction, coronary atherosclerosis, myocardial and ischemia with no significant side effects. It can significantly reduce the incidence and mortality of coronary heart disease. Long-term clinical application finds that the deposited fat can in the walls of arteries and veins can be effectively reduced or removed, which can significantly lower plasma cholesterol level, and thus preventing the formation of atherosclerosis. 3. Chondroitin sulfate can also be used for the treatment of neuropathic pain, nerve migraine headaches, joint pain, arthritis and scapular joint pain, pain after abdominal operation. 4. It can be used for prevention and treatment of hearing impairment caused by streptomycin, and hearing difficulties, tinnitus caused by a variety of noise with a significant effect. 5. It also has adjuvant therapy on chronic nephritis, chronic hepatitis, keratitis and corneal ulcers. 6. It is reported in recent years that, the chondroitin of shark cartilage has anti-tumor effect. In addition, chondroitin sulfate is also used for cosmetics and as healing agent of traumatic wound. Chondroitin sulfate is a kind of acidic mucopolysaccharides as an important component of ocular tissues. It can promote and improve the water metabolism of the cornea which is suitable for treating eye fatigue and dry eye syndrome. Chondroitin sulfate can clear the blood lipid and lipoprotein, clear the cholesterol on blood vessels around the heart, prevent atherosclerosis and increase the turnover rate of lipids and fatty acids inside the cell. Chondroitin sulfate can effectively prevent and treat coronary heart disease. It has effect of anti-atherosclerosis and anti-plaque formation on experimental atherosclerosis mode. It can increase the circulation of branches or lateral branches of atherosclerotic coronary artery, and can accelerate the healing, regeneration and repair of the myocardial necrosis or degeneration caused by experimental coronary artery atherosclerosis or embolism. It can increase the biosynthesis of cell messenger RNA (mRNA) and deoxyribonucleic acid (DNA) as well as having a role in the promotion of cell metabolism. It has a low anticoagulant activity. Chondroitin sulfate has a mild anti-clotting effect. Every mg of chondroitin sulfate A can yield equivalent anti-clotting effect to 0.45U heparin. Such anticoagulant activity is not relied on the effect of antithrombin III and it can take effect through the fibrinogen system instead. Chondroitin sulfate also has an anti-inflammatory effect, and can accelerate the healing of wound healing and have anti-tumor effects. [Character]Colorless or slightly yellow transparent liquid. [Pharmacological and toxicity effect]Chondroitin sulfate is widely existed in human and animal cartilage. Its pharmaceutical preparation mainly contains two isomers: chondroitin sulfate A and chondroitin sulfate C. It has effect of anti-atherosclerosis and anti-plaque formation on experimental atherosclerosis mode. It can increase the circulation of branches or lateral branches of atherosclerotic coronary artery, and can accelerate the healing, regeneration and repair of the myocardial necrosis or degeneration caused by experimental coronary artery atherosclerosis or embolism. Chondroitin sulfate has a mild anti-clotting effect. Every mg of chondroitin sulfate A can yield equivalent anti-clotting effect to 0.45U heparin. Such anticoagulant activity is not relied on the effect of antithrombin III and it can take effect through the fibrinogen system instead. [Pharmacokinetics]At 4 hours after administration, the plasma concentration reaches peak. The half-life is about 7 hours wherein about 50% excreted through urinary. The rank of its distribution in vivo is in turn: bone tissue, vascular walls, brain, and other connective tissue. [Indications]Suitable for nervous headache, neuralgia, joint pain, atherosclerosis and other diseases. [Dosage]use intramuscular injection for 1-2 times per day with 2ml once (one per time). [Adverse reactions]Individual cases of chest tightness, nausea, and slightly bleeding gums. [Taboo]Patients have allergy history should take the chemicals with caution. [Note]Patients with bleeding tendency should use with caution. Stop using once the drugs traits change. [Medication for Pregnant women and lactating women]not clear. Amorphous powder with white or slightly yellow color; easily soluble in water; insoluble in organic solvents; it is hygroscopic, odorless, and tasteless. It is used to treat coronary atherosclerotic disease, increased blood lipids and cholesterol, arteriosclerosis, angina pectoris, myocardial ischemia, myocardial infarction embolism for patients of coronary heart disease. Extract the pig laryngeal, nasal cartilage with 2% sodium hydroxide. Use crude trypsin to remove other proteins of the extract at 50 °C. Filtrate, adjust the pH of enzymatic hydrolysis solution to 6, and add ethanol to make a final ethanol concentration of 75%. Centrifuge and obtain the precipitate namely chondroitin sulfate crude product. Apply Multi-step refinement to obtain the finished product. For Pig throat, nasal cartilage count, the yield is 5%. Chondroitin sulfate is used in a wide variety of areas of research such as bioengineering. Chondroitin sulfate may be used as a biomaterial copolymer or surface derivatization reagent in the development of drug delivery vehicles, tissue engineering devices and bioscaffolds. Chondroitin sulfate may be used for the development of biocompatible structures such as hydrogels, sponges, biofilms, microspheres and micelles. chondroitin sulfate is reported to increase water-binding properties when used with hydrolyzed protein and to enhance the moisturizing effects of creams and lotions. In the skin, chondroitin sulfate is a glycosaminoglycan component.